Autonomous water supply and irrigation systems | Atmosfera™. Альтернативные источники энергии. Солнце. Ветер. Вода. Земля. 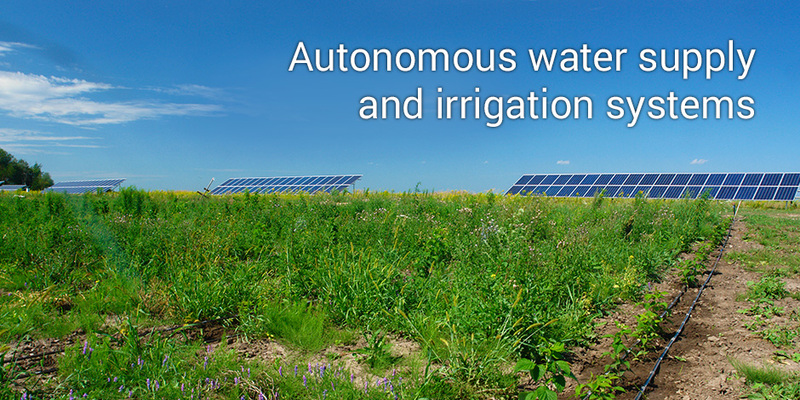 Autonomous water supply and irrigation systems that use the solar energy, supplied by Atmosfera, allows irrigating the agricultural lands with water from bores, wells or surface water bodies, where there is no power network. 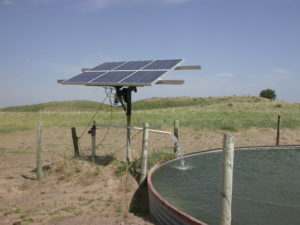 The solar irrigation systems operate during the day when the sun shines. They are completely autonomous and do not require any maintenance or human presence. The equipment that forms a part of the system – ABi-Solar PV modules and ABB frequency inverters – is high-efficient and reliable. The systems are compatible with any pumps with asynchronous motors. 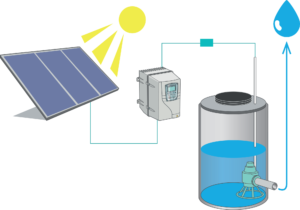 The autonomous water supply and irrigation system, based on solar panels, is equipped with photo modules with capacity of 260W and special solar inverters for pump station from ABB. The relative low range of prices for kits is stipulated by simplicity of the systems that consist only of two elements. The system is completely autonomous and its operation may be controlled on remote basis through the internet.